What were the main uranium trends in 2018? From production cuts to new uranium developments, it has been an eventful year for the metal. After starting 2018 on a low note, the U3O8 spot price has grown around 40 percent to reach US$28.95 per pound, where it sits today. 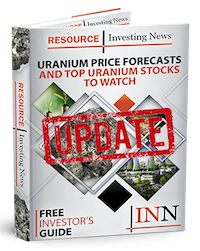 As the year ends, the Investing News Network is looking back at the main uranium trends of 2018, including long-lasting production cuts from two of the largest uranium suppliers, government probes into national security and the long-term effects of new uranium developments. Read on to learn what happened in the uranium market in 2018, from key supply and demand dynamics to how market watchers thought the market performed in every quarter of the year. After a year that saw the U3O8 spot price rise as high as US$24.50 and sink as low as US$19.60, many analysts were predicting that 2018 would bring a market rally. That sentiment was reinforced when Kazakhstan, the country with the largest annual uranium production, said it would reduce its output by 2,000 tonnes, sparking a brief price spike. Following the Central Asian country’s lead, uranium producer Cameco (TSX:CCO,NYSE:CCJ) announced it would likely shutter its McArthur River mine, the biggest high-quality uranium deposit in the world. The production cuts in Kazakhstan and Canada were the result of depressed prices, which make development and production unsustainable, and were a recurring refrain throughout 2018. “Access to capital remains a real challenge, although we have seen some green shoots emerging late in the year with a dramatic resurgence of investor interest in the sector,” Craig Perry, president and CEO of ISO Energy (TSXV:ISO), said when asked about challenges in the uranium market this year. In late January, Energy Fuels (TSX:EFR,NYSEMKT:UUUU), a US-focused uranium producer and explorer, petitioned the federal government to examine the American uranium sector. “We prompted the US government to launch a national security probe into today’s high levels of uranium imports into the US; this probe could result in trade quotas, tariffs or other support for US uranium producers,” said Curtis Moore, vice president of Energy Fuels. If successful, the petition could result in the government demanding that as much as 25 percent of America’s uranium supply be produced domestically. In April, the U3O8 spot price sunk to its 2018 low of US$21; however, by early May a recovery was well on its way, with the price jumping to US$22.73. During the second quarter of 2018, Kazakhstan announced it would further cut uranium production for the year, from 64.5 million pounds to 56 million pounds. By July, the U3O8 spot price had climbed up 13.42 percent from May, to US$25.78. Meanwhile, Cameco doubled down on its decision to indefinitely close both its McArthur River mine and its Key Lake mill, an important processing hub in the Athabasca Basin. The announcement not only signaled a production halt at Canada’s largest uranium project, but also turned Cameco, one of the largest uranium companies, into a buyer, as the energy company looked to the spot market to fulfil its contracts. Production cuts by some of the world’s largest producers contributed to the upward price movement, which was also fed by increasing demand, some of which came as a surprise even to uranium experts. “The demand-side factor we didn’t predict was the entry of financial entities into the uranium market as major buyers, including Yellow Cake (LSE:YCA), Tribeca Partners, Uranium Trading Corporation and Uranium Participation (TSX:U),” noted Moore. These uranium-focused funds have been buying at depressed prices and stockpiling the energy fuel ahead of the price resurgence. This may help to spur a global shortage, further boosting the spot price. When asked what the biggest news in the sector was for 2018, Mercenary Geologist Mickey Fulp pointed to the production cuts in Canada and Kazakhstan, as well as the US petition, as the major stories. Q3 2018 was marked with continued growth in the U3O8 spot price, much to the delight of industry insiders. Starting the period at US$25.78, by the end of Q3 the U3O8 spot price had jumped to US$27.50. “I predicted a rise in the spot price of uranium, but was pleasantly surprised by the slow and steady manner in which it has happened,” stated Fulp. The continued incremental increase in the spot price was likely brought on by the realization that a supply shortage will undoubtedly materialize — perhaps sooner than later. Projected global uranium production for 2018 is pegged at 120 million pounds, 41 million pounds short of the 2016 production total of 161 million pounds. The effect Holmes is referring to is when utility companies that rely on uranium for nuclear energy decide to stop buying on the spot market and sign long-term supply contracts. The fourth and final quarter of 2018 saw the U3O8 spot price continue to climb. By the end of November it had jumped to US$29.10, though it then slipped slightly to US$28.95. Depleting global reserves and the addition of uranium companies buying on the spot market, along with the continued commissioning of new nuclear reactors and the creation of uranium-specific funds, all contributed to Q4 spot price growth. In addition to the steady six-month consecutive price growth, 2018 was also a busy year for the global uranium sector, with a number of production decreases, site closures and mergers and acquisitions. In fact, Q3 brought more spot market transactions and volume than any other time in history. In the latter half of the fourth quarter, multinational diversified miner Rio Tinto (ASX:RIO,LSE:RIO,NYSE:RIO) announced plans to sell its stake in the Rossing uranium mine, one of the oldest uranium mines on Earth. The US$106.5-million deal will see the Namibian mine go to private company China National Uranium. Moving into January 2019, Sightline U3O8 predicts the U3O8 spot price could climb to US$29.50, then continue with incremental upticks of the US$2 to US$3 for the rest of the year. In mid-2019, the US decision regarding uranium as an issue of national security should be handed down. There are also some 205 nuclear reactors either under construction or planned around the world. These factors will likely contribute to U3O8 spot price performance in 2019. Our upcoming uranium outlook for 2019 will cover more market predictions. Stay tuned! Editorial Disclosure: Energy Fuels, IsoEnergy and Plateau Energy Metals are clients of the Investing News Network. This article is not paid-for content. Investors be aware. Fake uranium breakout with the cuts . Long term glut will take several years to clear .